OK, what do we learn today? 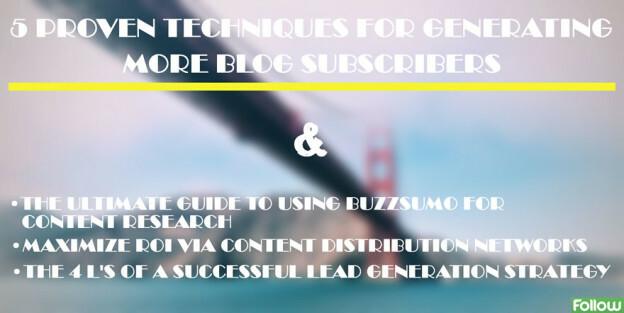 1) A series of tips for building a blog audience the right way through email marketing, 2) the definite guide on how to use BuzzSumo for content research, 3) how to maximize ROI via content distribution networks (Outbrain, Taboola, etc. ), and 4) the 4 L’s for lead generation success. 5 Proven Techniques for Generating More Blog Subscribers – Discover here a few tips for building a blog audience the right way through email marketing. Making readers feel compelled to sign up for your newsletter is a challenging goal, but there are always a few things you can do to improve the odds of success. The Ultimate Guide to Using BuzzSumo for Content Research – BuzzSumo is an extremely valuable tool if you work in content marketing. BuzzSumo allows you to find the type of content that is most shared on the web, find influencers, monitor keywords and competitors, and much more. Click above and find out almost all there is to know about this useful tool. Maximize ROI via Content Distribution Networks – This company started to use content distribution networks (Outbrain, Taboola, and nRelate) in 2013. Their main goal was “to test a variety of distribution networks to determine the best ways to pay for promotion on client content and assets.” These are the results of their experiment. The 4 L’s of a Successful Lead Generation Strategy – So, what are these 4 L’s? 1) Lead capture, 2) lead magnet, 3) landing page conversion techniques, and 4) lead scoring. Read the article to discover more details. This entry was posted in Customer Acquisition Strategies and tagged blog audience, BuzzSumo, content distribution, content distribution networks, content research, customer acquisition, email marketing, lead-generation, maximize ROI, ROI, success on February 6, 2015 by Davide Di Prossimo.